This year Mappin & Webb celebrates its 240th Anniversary. To mark this significant milestone the brand is hosting an exclusive preview of contemporary silver from the prestigious Goldsmiths’ Fair. The 13 silversmiths featured represent the newest and finest works in contemporary British silver, in a fitting event designed to celebrate Mappin & Webb’s silver history and royal warrants. and His Royal Highness The Prince of Wales. This unique retail event marks a new collaboration between Mappin & Webb, the Goldsmiths’ Company and Contemporary British Silversmiths, and offers a unique preview of the designer silversmiths who will present their latest designs at the prestigious Goldsmiths’ Fair this coming September. a treasure trove of creativity, design innovation and superb craftsmanship. 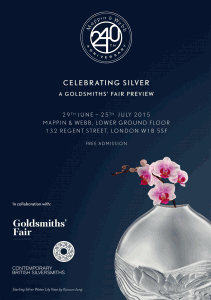 Goldsmiths’ Fair features 168 exceptional designer-craftsmen from independent workshops around the UK. Every item exhibited is hand-made with extraordinary skill and artistry. Contemporary British Silversmiths is the only professional body exclusively representing UK silversmiths both nationally and internationally. The association was set up in 1996 with the aim of raising the profile of the unique craft of silversmithing through public exhibitions. In promoting the design and creativity of the silversmith, it has worked closely with institutions such as the Goldsmiths’ Company, the Victoria and Albert Museum, Christie’s London and the Silver Trust Collection at Downing Street to create bespoke exhibitions that support its aims of promoting contemporary silver to a global audience. Mappin & Webb has an undisputed heritage of excellence in the craft of silverware and fine jewellery, which has been at the heart of affluent English society for over 240 years. The Queen and His Royal Highness The Prince of Wales. Mappin & Webb produces everything from exquisite jewellery pieces to elegant silverware, watches, glassware and unique lifestyle accessories.